The old town of Cunduacán, that according to the mexican etymology means:” Place of pots “, is located in the state of Tabasco, México. 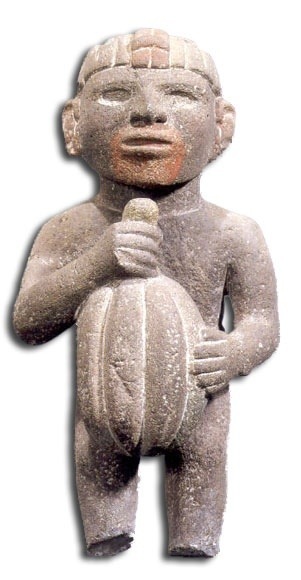 The legend says that the Aztec gods had provided power to a bird in order to detain the tribe Cunduacana when they arrived to these lands. Under this place, a bell of gold was hidden and it had been anxiously waiting for the arrival of this tribe during centuries; the bell should never be extracted from the hidden location or the town would collapse in a catastrophic way. It is even said that, at night, the bell used to fertilize the fields with a golden sparkle. Finca La Joya is a plantation of cocoa located near Cunduacán. Awarded in 2010 by the International Cocoa Awards in the Salon du Chocolat de Paris, the cocoa of La Joya is a Criollo type. This cocoa is named Criollo Blanco due to the pale colour and whiteness of the beans. Almost 70 years ago, Carlos Echeverría became the owner of a small cocoa plantation and decided to use his vineyard knowledge in order to identify the best trees. After using the grafting technique to improve the yield of the trees, he finally built his own clon which is currently known as Carmelo C1. Astonished by the quality of the cocoa, he changed the name of the rancho El Carmelo to Finca La Joya, as joya means jewel in english. At that time, the C1 was planted in 50 hectares but unfortunately, after the death of Carlos, his son decided to replace the cocoa trees with cane sugar. 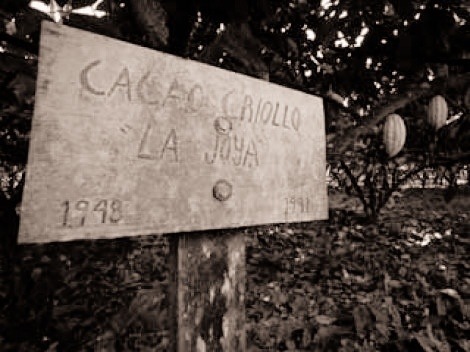 However, her daughter Clara, driven by the dream of her father, replanted 2,5 hectares of this precious C1 and the results couldn’t just be better; the cocoa is now sold as a unique product and regarded as one of the best in the world. Only Pierre Marcolini and Cacao Sampaka offer chocolate made with this fine terroir. It’s always difficult to describe the taste of a chocolate. Even more if you get a chocolate made with such a wide range of diferent sensations. You may find red fruits, prunes, raisins, tobacco, liquorice and a spicy acid taste. The fusion amongst the described tastes goes up and down, strong and smooth like a piano symphony. I think I have found a music with grafical score that could perfecty match with the profile of La Joya. I invite you to click on the following link Clair de Lune, by Claude Debussy, played byStephen Malinowski, with graphical score. Now, first, close your eyes and taste the chocolate with music. Afterwards, without any chocolate, just listen to the music and check if the grafical score could describe the flavours that are still kept in your mind. “…It is very likely that the best decisions are not happening as a reflection of the brain but as the result of the emotion…” – Eduardo Punset, Spanish lawyer, economist, and scientific .